VIRGINIA BEACH VA, (July 20, 2017) – According to AAA, prices at the pump right now are giving consumers sticker shock in the best way possible, but this “Christmas in July” will be short lived. 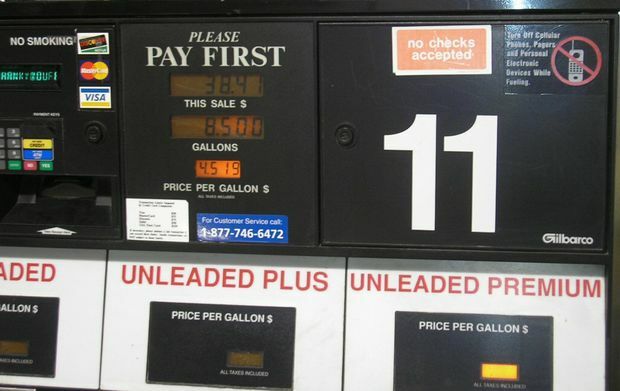 AAA forecasts the summer national gas price average will increase –by at least 10 cents – and has the strong potential to top this year’s highest national average gas price of $2.42, which was recorded in March. The recent low was $2.23 witnessed in June, a time when consumers typically see gas prices soaring. The anticipated volatility is due to refiners continuing to run record levels of crude oil, which is creating high levels of gasoline and diesel. In addition, the summer season’s strong demand is expected to stay on pace and may even set a new record high between now and Labor Day. Virginia’s price for regular gas is currently $2.05, which is two cents more than last week and six cents more than last year. This average is fairly consistent across Virginia with the exception being the Roanoke area where the average is $2.01 per gallon. Hampton Roads is starting to feel the increase with the current price for gas at $2.06, which is five cents more than last week and 12 cents more than last year. Richmond is slightly less at $2.04, an increase of four cents from last week and a seven cent climb from last year. Today’s national average gas price is $2.28, which is one cent less than one month and nine cents more than one year ago. Consumers can find gas for $2.25 or less at 57 percent of gas stations across the country. More so, 40 percent or more of gas stations in nine states are selling a gallon of unleaded gasoline for $2.00 or less: South Carolina, Tennessee, Arkansas, Louisiana, Mississippi, Alabama, Oklahoma, Texas and Virginia. Only two percent of all gas stations in the country are selling gas for $3.00 or more. Surprises in the wholesale market - Looking back at the first six months of the year, wholesale oil prices have not performed to forecasted levels. West Texas Intermediate (WTI) was predicted to sell between the $55-60 bbl, but the first half of the year saw the benchmark grade average just $49.98 bbl. There were periods in March, April and May that yielded crude prices on either side of $50 bbl, but June saw a recalibration with WTI flirting with $42 bbl. For the immediate future, WTI is likely to remain below $50 bbl – giving drivers more savings at the pump. 2017 Rings in Record Oil Rig Counts - The swaying price of crude did not deter the U.S. from increasing production for most of the first half of the year. January through June saw record growth in the number of oil rigs in the U.S. Currently at its high point, there are 765 active rigs, according to Baker Hughes, Inc. That eye-popping number is 408 more rigs than last year’s count at this time. With each additional rig, the U.S. gains further domestic capacity and export prowess. This trend speaks to the growing U.S. influence in global crude markets, with light tight oil from shale a clear game-changer. Record growth in production- Increases in gasoline production rates from refineries highlight a continuing trend since the summer of 2015. During the first part of Q2, gross inputs to U.S. petroleum refineries, also referred to as refinery runs, fluctuated between a record high of 17.7 million b/d and 17.5 million b/d. According to the Energy Information Administration (EIA), weekly refinery runs have exceeded 17 million b/d only 24 times – all within the past two years since the publication of such data was initiated in 1998. For 2017, these record run rates led to refinery products, such as gasoline, to be stored, supplied domestically, and exported at levels that were above five-year averages for each of those categories. With growing production, consumers will likely continue to benefit at the pump – assuming crude prices remain low. On the flip-side, increased prices of crude oil could lead refineries to produce less gasoline in the face of low or moderate demand. Two other factors may also cause prices to shoot up fast and furiously in late summer: hurricanes and exports. Hurricane season: Hurricane season began on June 1 and ends on November 30. According to the National Oceanic and Atmospheric Administration, there is a 45 percent chance of an “above-normal season.” Taking into consideration that the 2016 season was the most active since 2012, with 15 named storms, including seven hurricanes and four major hurricanes, there is a strong likelihood that hurricane activity will influence gasoline prices this fall. Hurricanes have the potential to destroy demand, but they typically have a limited impact on supply. It may seem counterintuitive, but this observation takes into account that the mere threat of a hurricane typically tightens gasoline supply and can cause precautionary refinery shutdowns, which ultimately halt supply production for a short time period. However, post-hurricane, refineries return to full operation status as quickly as possible and imports are an option to return supply to pre-hurricane levels. That is not to say hurricanes do not have the potential to destroy supply. Major hurricanes, like Hurricane Katrina, are outliers. gasoline have more than doubled since 2010, growing from 335,000 b/d in 2010 to 761,000 b/d in 2016. Unless there are dramatic shocks to the U.S. supply chain for gasoline, this trend will continue growing through the end of 2017. Brisk summer driving season demand should give way to consumption that may be flat or fall short of autumn and winter 2016 levels. Consumers can expect the average prices for gasoline the second half of the year (July – December) to be under $2.25 gallon, less than the average from first half of the year ($2.32 gallon). There is a strong chance that over 40 percent of motorists will be able to find gasoline for less than $2 gallon at some point in the second half of 2017.